It was touch and go this morning, what report will you get, Gotherington, or another tamping day? Well, this is what makes working on the PWay so exciting, you never know what you will get. 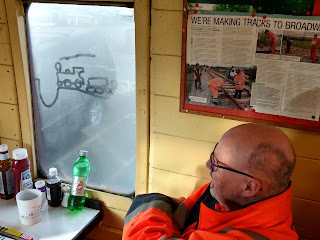 We met in the mess coach at Toddington, where there was a large contingent waiting for tea, some with idle hands. 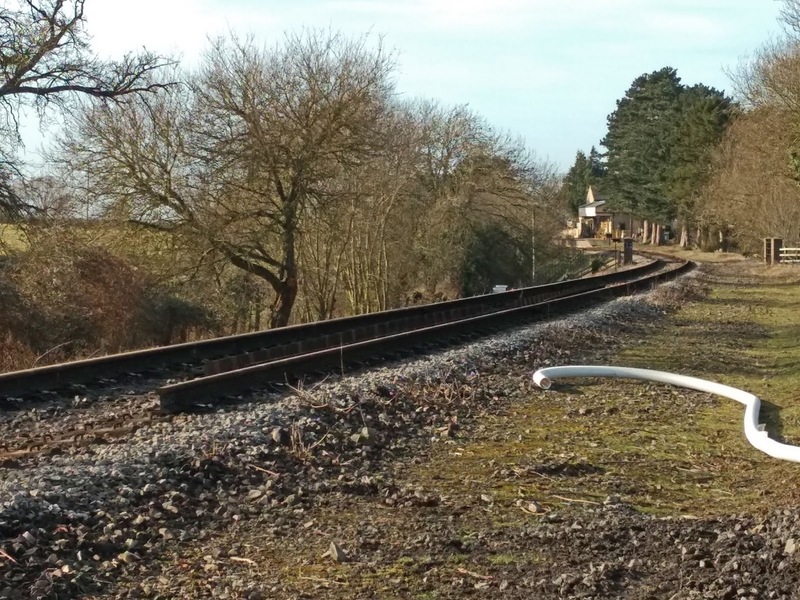 It seems that this steam locomotive - could it be Foremarke Hall - is about to fall into a void of ballast in the track. But then out again, on the other side, we read into this. 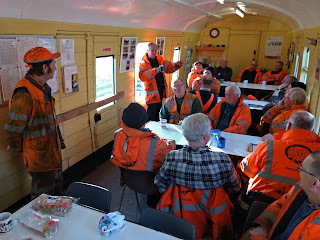 Clive held forth - he's good at this, holding forth - about the Gotherington job of relaying the track across the bridge, for which we got the green light a week early. An opportunity then to make up some time. The trouble was, Clive was due to accompany the tamper crew today, and next thing you know, some other mug sat in that juddering thing today - yours truly, again. Clive was off to Gotherington instead. So you get a Broadway tamping report today. 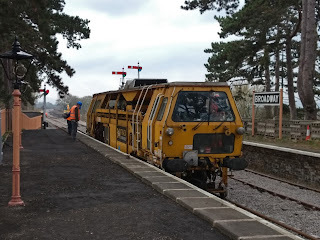 As the team was quite a large one today, a smaller gang was split off and dispatched to Broadway to shovel ballast. Here they are, filling the voids between the sleepers created by the tamping yesterday. Is that what the misty cartoon was about? The tamper arrived from Toddington, yours truly by car instead, so that he could take the crew back by road at the end of the day, leaving the machine in the platform at Broadway overnight. 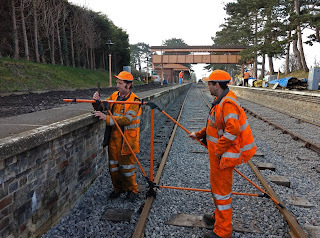 The first job was to measure by hand the height of the track vis a vis the platform edge, and determine which was the highest spot. The tamper then did a measuring run, and afterwards slowly worked through along platform 1. The Cotswolds side tamping bank first had to be moved inside a bit, in order to stay clear of the platform edge. How do you reckon this works then? 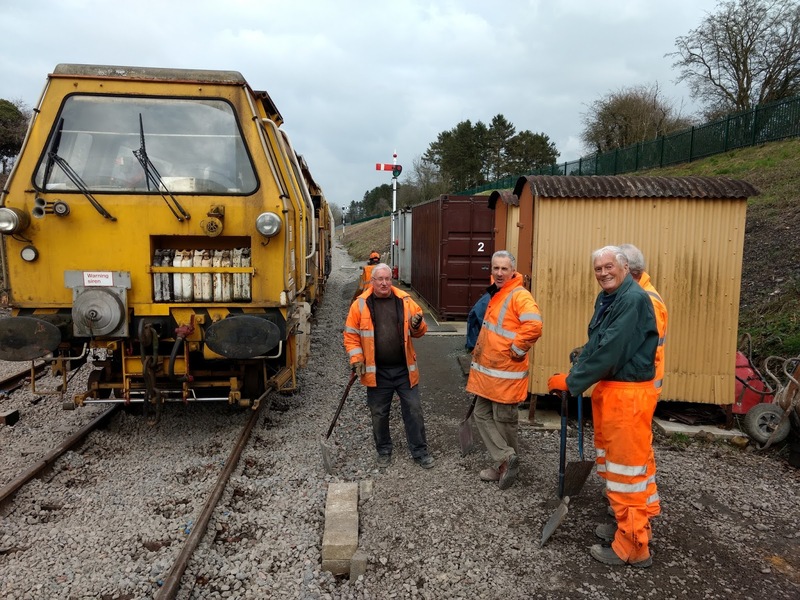 The noise of the tamper engine, the hydraulic pump and the vibrating tines resulted in a clatter of falling tools at Broadway, and a collection of curious volunteers who all wanted a closer look at this big yellow machine. Some found that a shovel made a useful prop against which to lean while studying the workings of this strange, noisy machine as it slowly passed. There were occasional stops to service this 40 year old machine, and we see it here paused by the signal box as one of the crew guides it past the recently dug stormwater drain connection in the centre of the track. 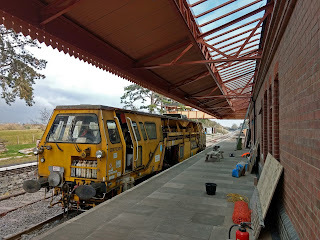 A deserted platform at 11.05, tea time, as the tamper is lit by the light passing through the canopy glazing. Looking behind us, you can start to see a straight road on the left, and a wobbly one, still to do, on the right. That will be for tomorrow. 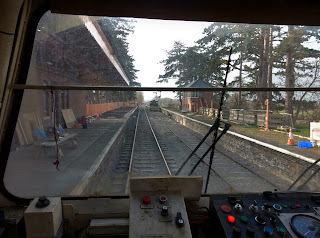 The view from inside the cab of the straight road just tamped and aligned through the station. Will it be finished on time then? 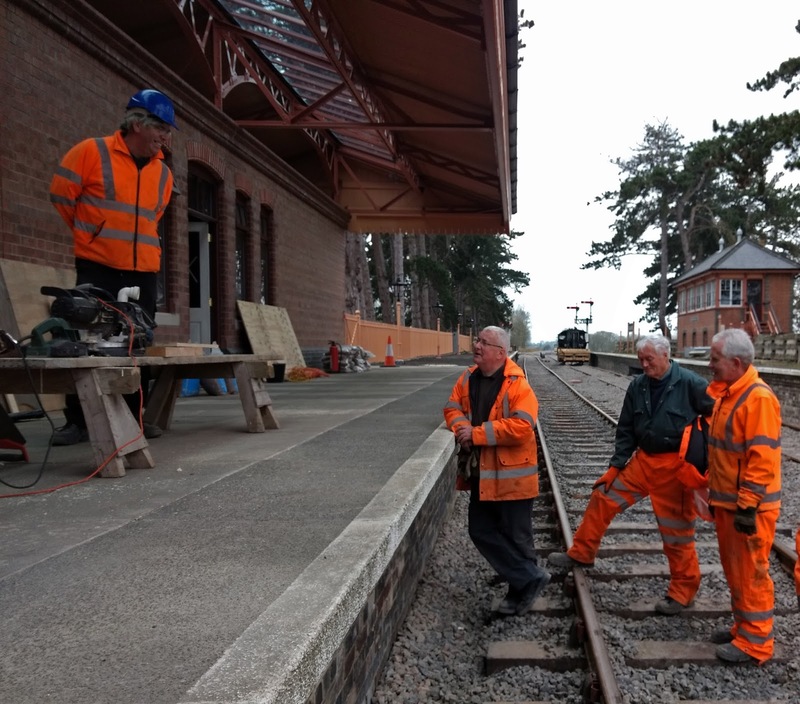 Just before lunch, and with the tamper juddering away in the distance behind the camera, the ballast shovelling crew wander into the platforms to see how the station gang is going on. Neal tells it to them like it is. After the first run through the platform on the down line is complete, the tamper crew re-measure by hand the height of the track as now packed. A few low areas subsist, principally due to insufficient ballast in those places. 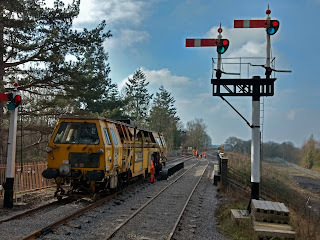 We were very conservative when dropping ballast here, with the idea that you can always drop a bit more, but you can't take it away. A second pass is decided on. 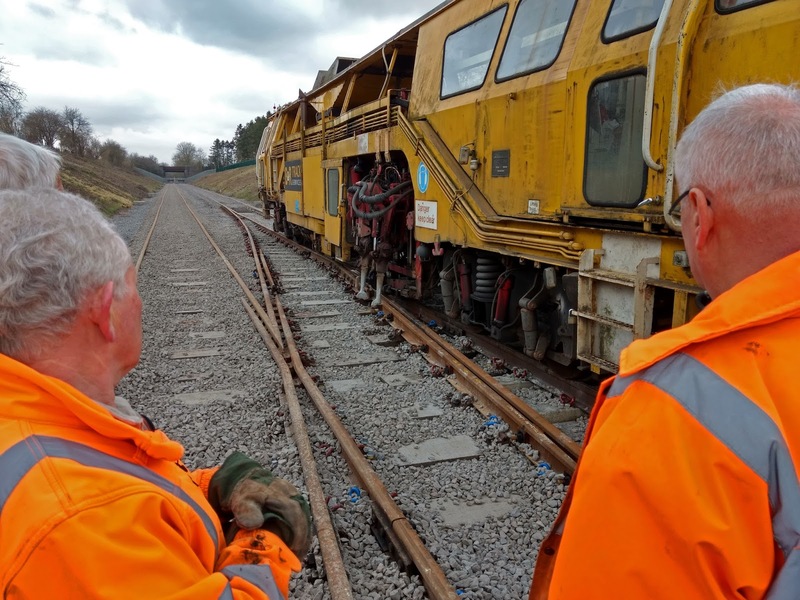 After lunch the tamper measured up the headshunt stretch, and then returned to start work by the turnout. The ballast gang have decided to start filling in voids here, having done the area of the southern tunout as far as it was possible. There's always time though to pose for the photographer. It was fascinating to watch the tamper play around with the tamping banks and individual tines in order to consolidate the northern turnout here. It was quite a ballet, and tricky to perform without hitting anything and ruining one of the tines on the downstroke. 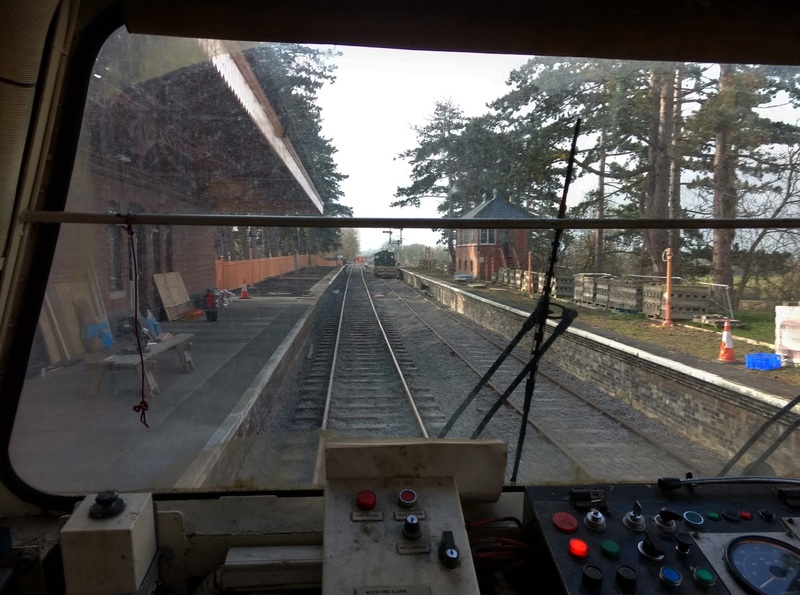 At the start of its measuring run we caught the tamper parked right up against the buffers of the headshunt here, which we reckon was an 8 or 9 coach length from the inner home signal. We shall see in practivce what it can hold. 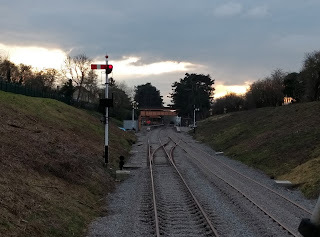 As we worked our way slowly along the headshunt to its northern end the light began to fail and it quickly got dark. On the left the track is done; on the right is for tomorrow. This is the end of the day shot, taken from Springfield Lane bridge. 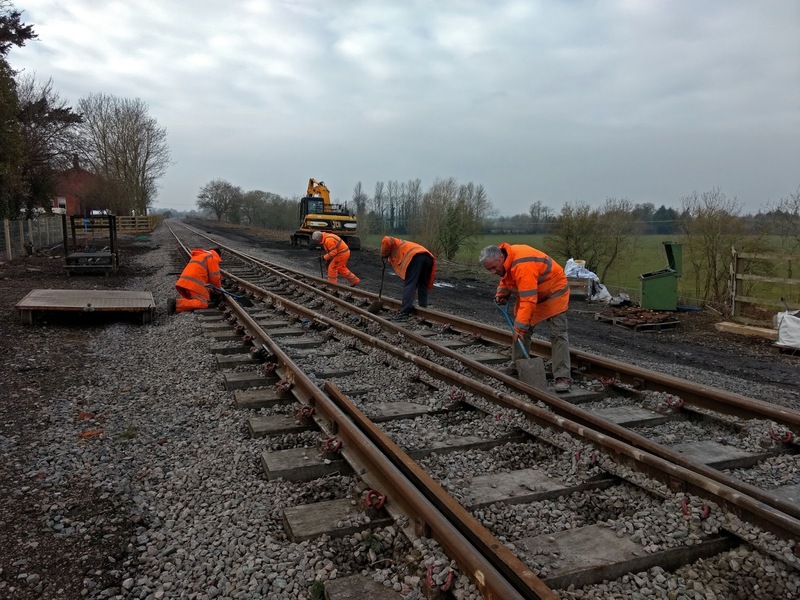 Just a few more yards to go for the tamper, then it's the end of the road, unless we extend to Willersey halt a mile away. The green fence on the left has turned orange in the setting sun. But of course this isn't the only thing we did today, the main gang was working at Gotherington. 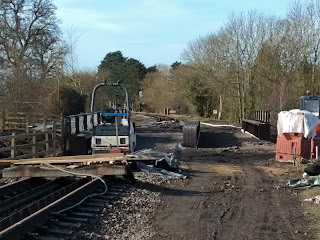 Last week we took a look at the bridge repair site, and took a few shots to give an idea of the job facing the gang today. 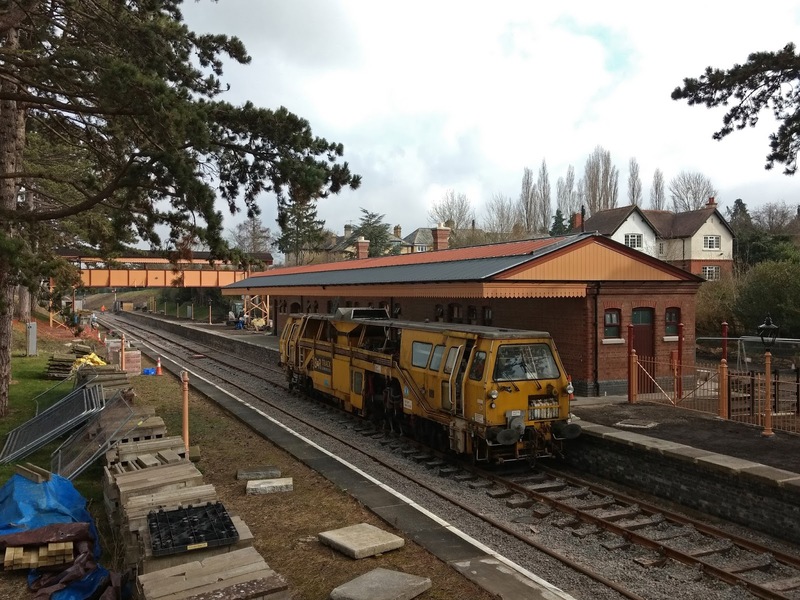 The contractors had almost finished the job, with just a bit more ballast to lay down on the bridge deck. On each side you can see 4 rails representing the 2 panels taken out on each side. That would be the job for today. 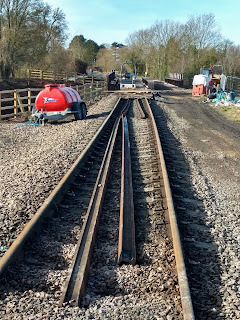 The track stops on the left, then there is a 4 panel gap, which here has been refilled with ballast and was being rolled. The road on the right is now for vehicles; once it was the up line and express trains came past here at 60mph. On the other side the original track resumes and is soon in the confines of Gotherington station in the distance. 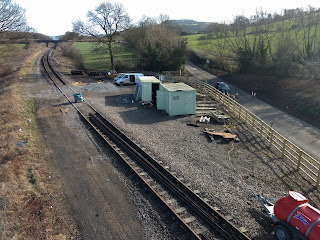 Here's a useful overview of the whole site, seen last Friday. The rails taken out are parked in the four foot, while the wooden sleepers were discarded and these will be replaced with new Jarrah ones. 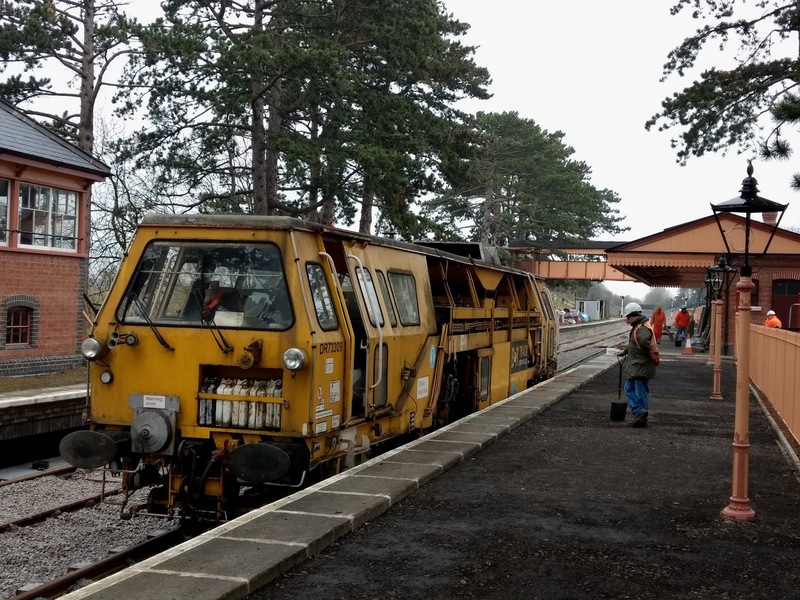 Concrete sleepers remain in place up to the deck itself. 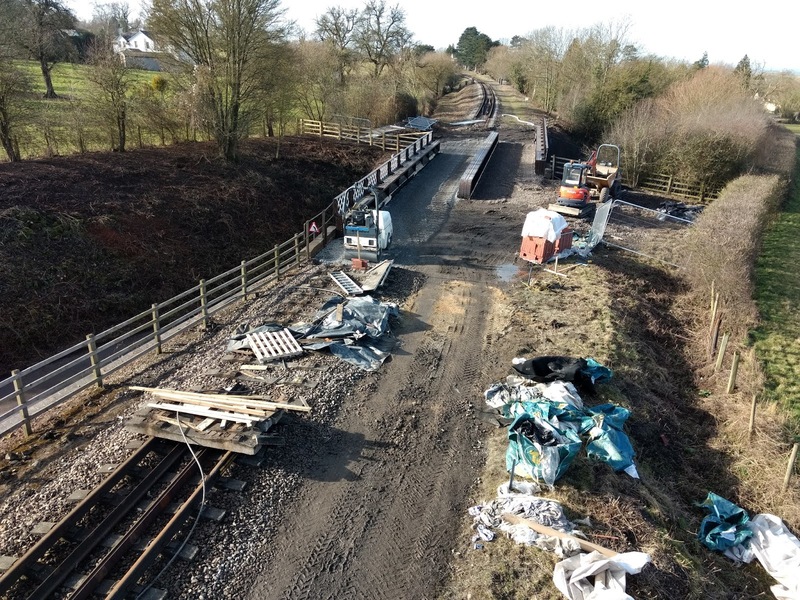 Looking the other way in this 'drone's eye view' you can see Skew Bridge sleeper depot (now completely empty) and the line heading north towards three arches bridge. Thanks to a local cub reporter Jonathan, we can show you pictures of the relay work today. The vehicle road on the left has been finished, and sleeper laying has commenced on the down line on the right with bright orange hardwood sleepers. These are brought in by Dave here in the Telehandler. The Jarrah sleepers are too heavy to be shifted anything more than a few inches by hand. The line of new sleepers soon stretched into the centre of the bridge, with no difficulties encountered. That is a relief, so everything so far is going smoothly and we are one week ahead of schedule too. Soon the other side of the bridge was reached. Dave brings in the last few sleepers, which are spaced out by the white boards in the foreground, brought down from their former duties on the extension. It's not a minute too soon either, they are completely worn out now. 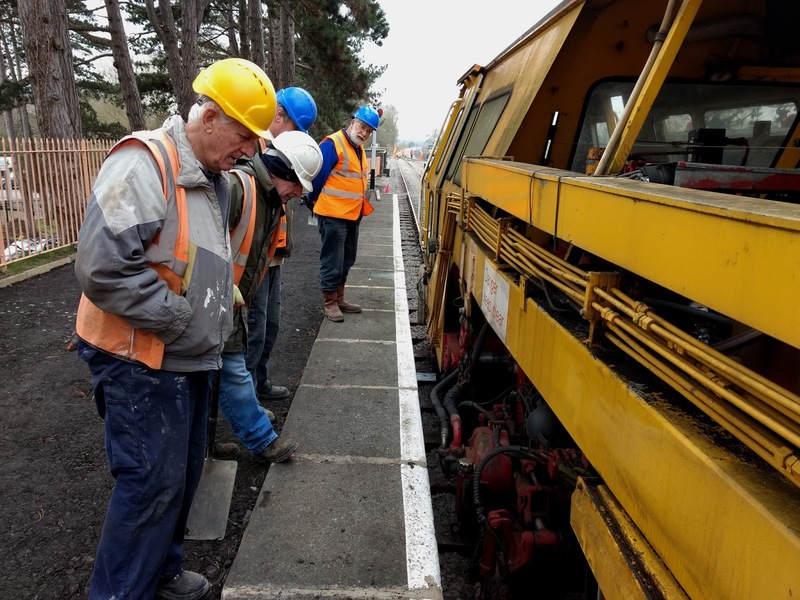 The old sleepers are stacked on the left here, as Bob and Clive use the 'animal' on a set of bullhead chaired sleepers in the background, purpose unknown as in this area we have FB rails. Perhaps that is why they were doing it discreetly round the corner. Finally Steve laid in the rail again, an easy job for him as he could simply stand on the adjacent up line to do this. That's it for today, a job on two fronts and great progress on both. Well, it's brilliant work at Gotherington. The PW team is doing everything perfectly. As always. I'm not sure where they are up to at Broadway. 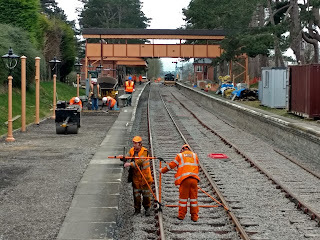 More tamping ? 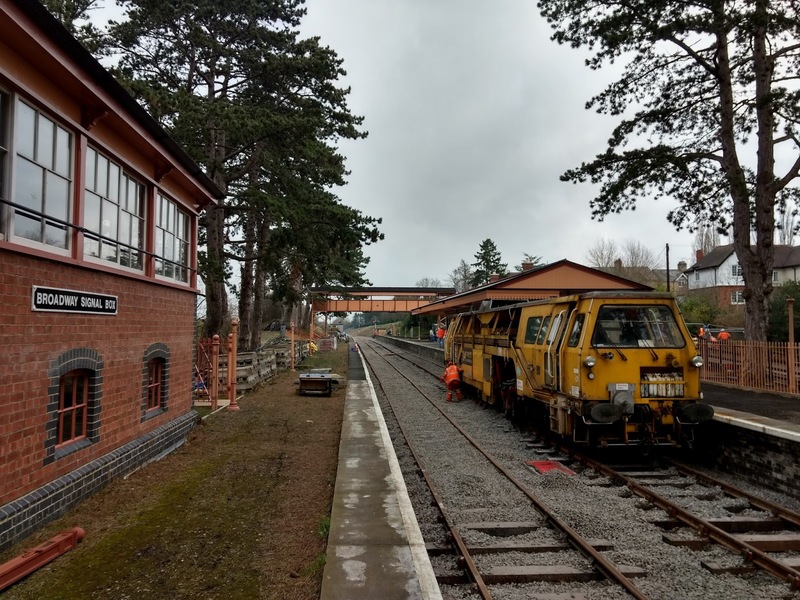 More ballasting to the south ? 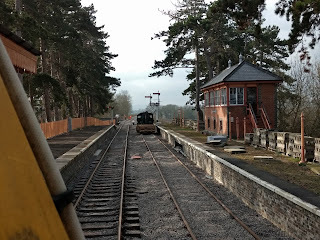 But what about the second turnout at Toddington ? Oh, I know you'll get it done. Somehow. We'll have to wait and see, won't we ? Bless you all. Keep up the good work. And be nice to the Railways Inspector when he calls. What a difference a Tamper makes! Almost a song, but not quite! The main (down) line does look better having been tamped though. Trust you lot to sneak into the platform while the Broadway gang were all having tea! All this work done without Mrs. B's cake and no sign of Pauls Catering coach to keep the team fed! 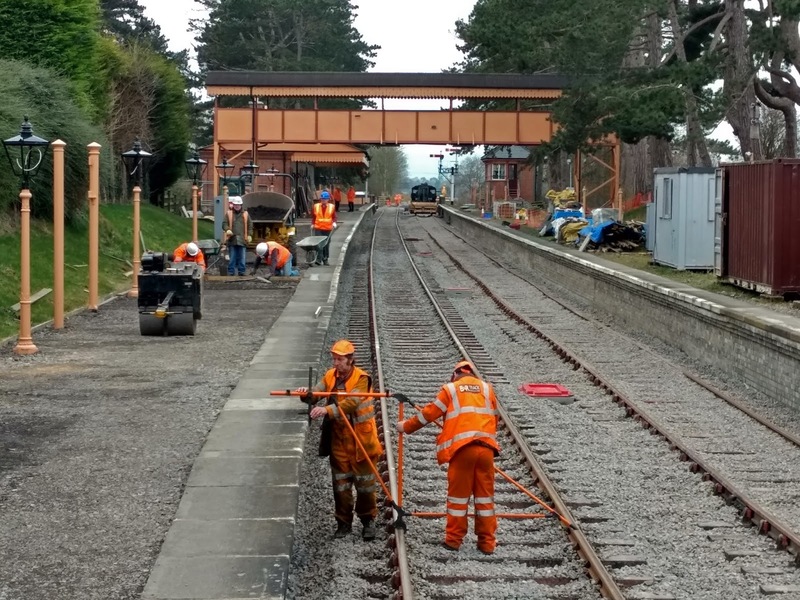 What a great effort, you will all be soon out of work at this rate, so can you put in the tender to lay track for HS2 now? Wonder when the line could have two lines all the way up and down? Now that would really make the difference!!! Thank you all for your Herculean efforts, well done all, at least it wasn't raining! 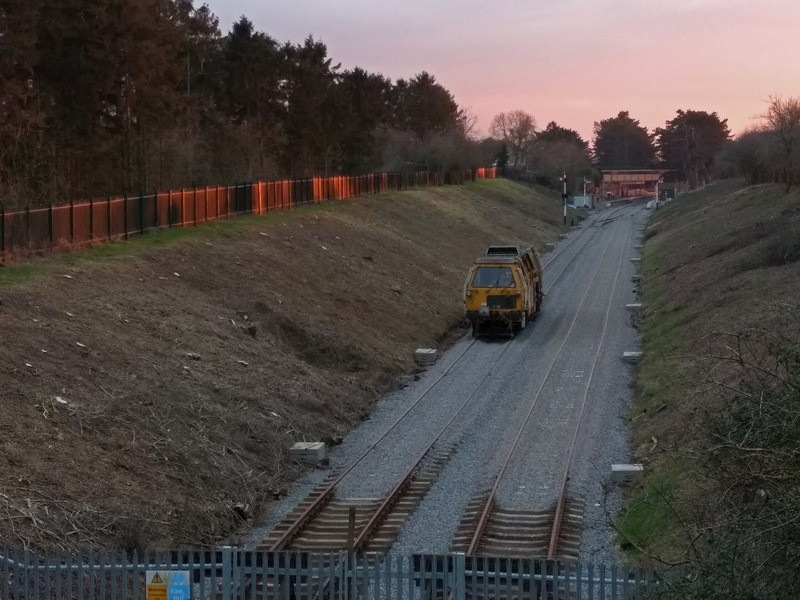 Many thanks for the excellent update, both for the tamping operation and the trackwork at Gotherington. Doubling the track would make a difference - it would cost a fortune! Don't worry about HS2 PS, it's not going to happen, at least in the way it's planned. A double track over Gotherington bridge ? At 60mph ? Yes, it would be nice, wouldn't it. Well, there's no harm in dreaming ! But, no. Toddington Ted is right. And HS2, in its projected form, isn't going to happen either. Why not ? Too expensive ! 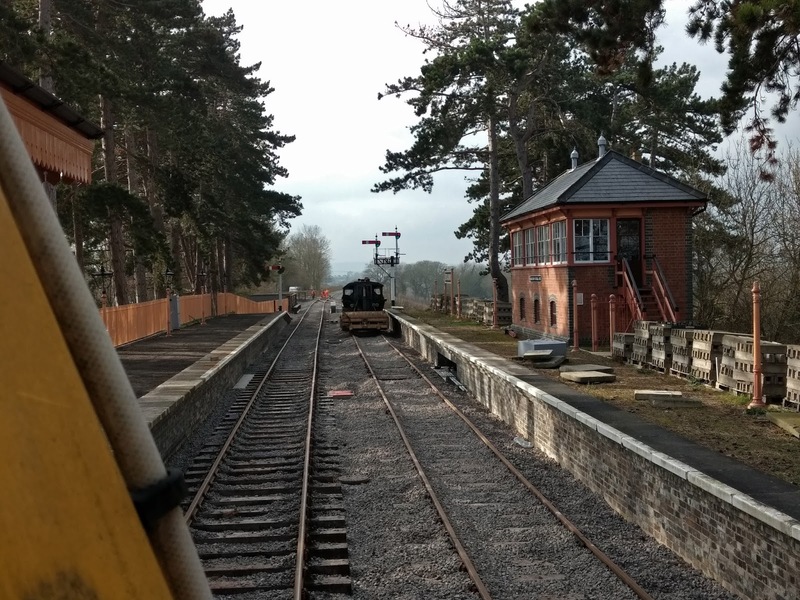 Noticing on the webcam today, that the permanent way through the station is looking very neat and tidy since the tamp, plus the passage of the regulator today. Now, just about the only thing missing is an express thundering through! 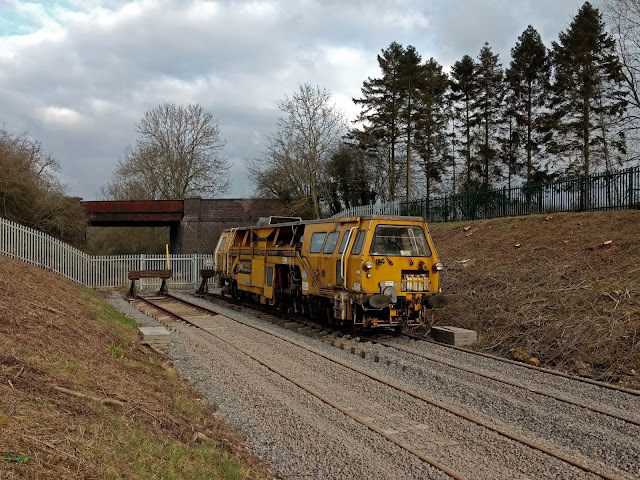 Reference to doubling of the P,Way why not ask around the coal fired power stations that have closed eg Didcot there is lots of flat bottom track there no longer needed , thought you could ask they may donate it or let you have it cheaper don't know unless you ask best of luck excellent progress ! The Railway Recycling website (the agency Network Rail use for disposal of surplus material) has track panels, sleepers (concrete and wood) and rail (FB and BH) for sale. You can literally build your own railway from the stuff they have for sale. Of course, I'm sure the agency will add their percentage, so this might not be the cheapest way of buying railway track. But it's nice to have a one-stop shop where you can choose exactly what you want.